Red Rising by Pierce Brown is the first novel in a trilogy. I have reviews of the other books Golden Son and Morning Star if you’re interested. I quite enjoyed this book, although I found the first part difficult to get into. It is hard to know what genre to fit this book into. It has a little bit of everything. 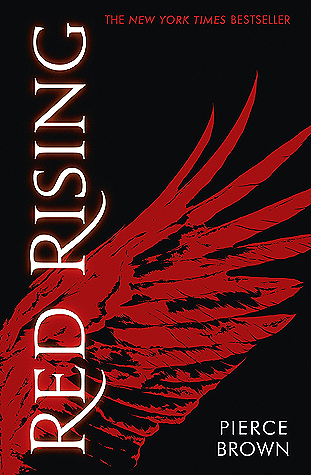 Red Rising is set in a dystopian society with a complicated social system, however it also takes place in space. There are also elements of adventure or action. The beginning of this book was very confusing. There were lots of different categories within society based upon job, clan, color etc. Once I got past all this weirdness, and began to understand what was going on I started to enjoy myself. I have to say that the turning point was the selection process to get into the institute. I really enjoy structure, so this made me happy. The novel is set up with a plot within a plot. The overall plot for the trilogy is your usual rebellion against dystopian society plot. However this one allows for time, a lot of other rebellion novels go from zero to one hundred really quickly. This one did not, nor was that ever the plan. Thus arose the plot for this book specifically, an all in battle to prove yourself to society. They started with 1200, and within the first week I think 65% are dead. Character wise, Darrow wasn’t that great. He was too mature for me to relate to him, however he was incredibly talented. I did really like Mustang. I knew from the first moment she popped up that she would be a character I liked. She was smart, and strong. Yet she didn’t really care about winning, or about having other people follow her. The author did a really good job of making me care about the characters just before he killed them. There were a lot of deaths. I enjoyed watching the characters bond, and create plans to take over other areas. I liked the tricks and traps, along with the adventure and survival aspects. Basically, I liked the part of the novel in the institute. I would happily read a novel purely about one time, preferably in third person narration so I can see how everyone is doing. With a death count. Unfortunately this wasn’t the main plot, and I am unsure as to how similar the rest of the trilogy will be. I do have the second book, so I will get started on that and let you know. I did like the world building, and found the different social classes to be very interesting however it would have been helpful to have a guide. I want so badly to see a bit more of the other groups. I can’t really put my finger on what I didn’t like about this novel, however there was something there. Maybe I was just sick of the ‘group of misfits overthrows society’ plot. I give Red Rising a 4 out of 5. Have you read Red Rising? What did you think? If not, do you think you’ll give it a try?